Yes, really, kids can make this! You see that picture above? My little 10-year-old Gabby made it. She prepped, cooked, plated and garnished. All I did was supervise, watch and guide. Gabby has developed a big interest in the kitchen and making yummy food. She took my recipe for my Creamy Garlic Alfredo Sauce and adapted it and added her own flair. The thought of having my baby (yes, I see her as my baby still) handle sharp knives, my gas stove, boiling water and frying pans frightened me. I’m not going to lie. But, seeing the accomplishment in her eyes and sense of self-development and pride right before my eyes allowed me to feel more at ease and very proud. Gabby loves my “Goodness Pasta”, that’s what she calls it. It’s a creamy, garlicky Alfredo sauce with pasta. Since she is a meatatarian, she wanted her protein! While Gabby is just a novice in the kitchen, she is getting better and better. She has a few signature recipes up her sleeve and she’s much more comfortable in the kitchen now. With everything, practice makes perfect and she’s on her way. Of course, we all know the saying that you need to dress for the job you want right? You will be surprised at what your kids can do if you let them spread their wings a little. With that said, I teach Gabby all I know in the kitchen and when you cook, you definitely need the right equipment. That and a super ADORABLE and functional apron from Sugar Baby Aprons! Gabby and I had the chance to try these out in the kitchen (YES, we totally match) and let me tell you, the boost of confidence this super fabulous apron gives you is out-of-bounds! Cute, huh? A super easy, kid-friendly recipe that is not only delicious, but easy for kids to make. Boil water, add salt and 1 TSP of Butter or Margarine. Peel and chop garlic finely and into small pieces. As small as you can. Check your chicken breasts to see if they need to be trimmed of any fat, trim it, if needed you can use a mallet to even it out. Add 1 TBSP of olive oil, season the chicken with all of the spices and herbs. Let it sit and marinate. Add 2 TBSP of margarine (or butter) to frying pan on MEDIUM heat. Add fresh parsley, onion powder and fresh garlic and sautee. Once margarine is melted, add the heavy cream, add salt and pepper and bouillon cube. Stir frequently and fold from the outside rim in. Once the sauce begins to thicken, add 1/2 cup of grated parmesan cheese. Stir until the cheese has fully melted, be sure to stir frequently so that it does not burn. Once the sauce has thickened, turn off the heat. In a pot, add pasta and your prepared sauce. Mix well. Add 2 TBSP of olive oil to frying pan and use MEDIUM heat. Add chicken breasts to the oil and being to fry. Turn once on both sides. Add 1/4 of chicken broth and turn to LOW heat and cover for 10 mins. Check periodically, turn if necessary. Check your chicken to see if it is cooked thoroughly. Take off heat and let it rest for a few minutes. 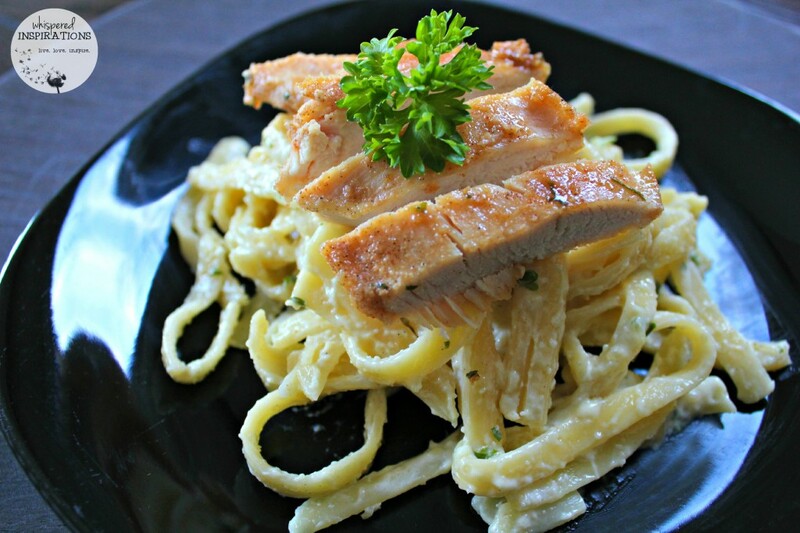 Cut your chicken into strips and top your pasta with the chicken. Get Cookin’ in The Kitchen! And there you have it folks, a complete entrée cooked by my 10-year-old! Don’t be afraid to hop in the kitchen and guide your kids. Not only are you showing them how to eat real and wholesome food but, you are teaching them skills they will use for the rest of their lives. Though Gabby is a beginner, she is fearless and willing to try and try again! She is excited to show you guys more of her recipes soon, so keep an eye on our YouTube! Plus, doesn’t she look FABULOUS in her Sugar Baby apron? If you want to get one for you and your daughter, you can get the Mommy and Me Set for $80. They are so well-made, feminine, cute and fun. Not to mention, functional. We love ours! Follow @SugarBabyAprons on Twitter or like them on FB, here. 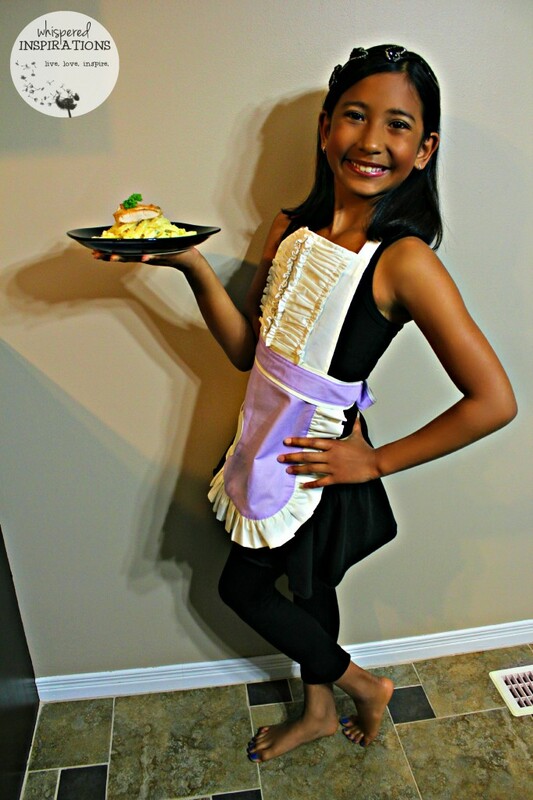 Do you and your kids cook in the kitchen? What a cute little model you have! Looks really yummy too!!! My recent post WIN A Trip to New York Fashion Week + $5,000 to Spend! I do agree, that is GREAT though! Very cool! My five-year-old loves to "be a chef" so I'll have to try this recipe with him! My recent post Denny’s is Fun Dining for the Whole Family! This recipe is fantastic. It's definitely something that my little one will ask for seconds! Fettuccine Alfredo is one of my favorite meals EVER. And if my kids can help make it? Awesome. Thanks for sharing! sounds great, love chicken alfredo! Your daughter looks very proud of herself – great job! Cute apron! My 9yo wants to cook all the time, it makes me so paranoid!! This looks so good and I know my kids would love it! That looks delicious and your daughter is adorable. My kids rarely cook now that they are teens but they did help when they were younger. I want to get her started so she keeps going! Sounds like a great recipe! My son got my love of cooking and does well in the kitchen, but my daughter still shies away from cooking. Start bit by bit, I was nervous at first but, she found her confidence. My pleasure, let me know how you like it! This looks like an amazing recipe! Your daughter is beautiful. Yes please! I love how your daughter is serving this meal up! I would eat that for sure! Looks delicious and she looks so cute. What a delicious sounding recipe.. and oh my goodness this is the cutest apron I have ever seen! Love it! The apron is ADORB, I totally agree! This looks so good. I need to teach my son to make it for me. FYI, I want to get an apron like that for my daughter and me to match. My recent post Take A Bathroom Break #LetsTalkBums! Plus $1.50 off Coupon for Cottonelle Flushable Cleansing Cloths &amp; Bath Tissue! They have the Mommy and Me set, I have a matching one too. It\’s adorb. I am going to have to make this. My kids will love it. That looks delicious, and your little chef needs to try out for MasterChef!!! Thank-you, she is working hard! 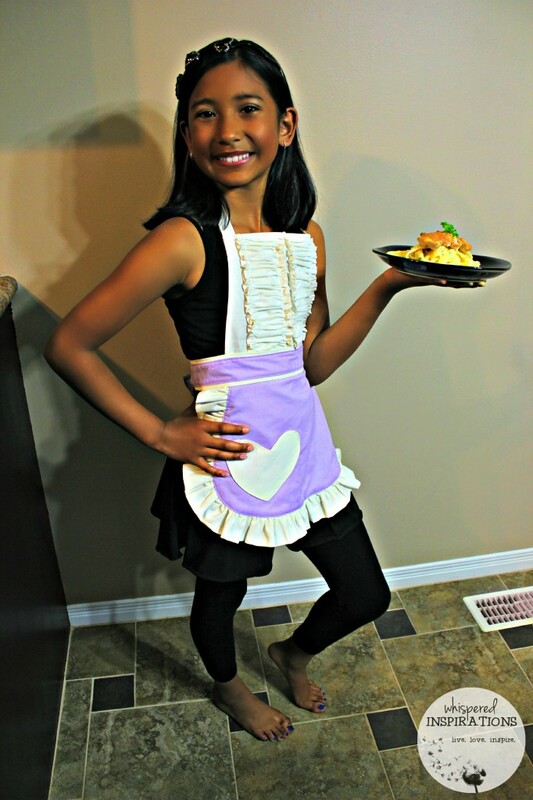 Love the apron, so cute! 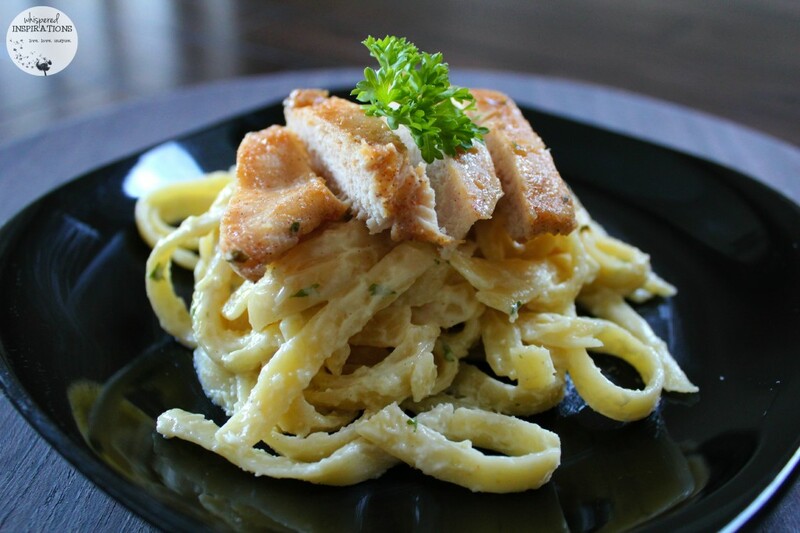 The chicken fettuccine sounds delicious too! I bet my son would love this!! Cute apron! My recent post Julep Maven May Box – Get Your First Box FREE! Thank-you the aprons are adorable, I have one just the same. She is too cute! This looks really yummy, my kids would just gobble this up! Thank-you, she was very proud. yummy! My kids absolutely love Alfredo (and so do I) I think making it fresh sounds fun and I know my girls would get a kick out of making dinner! Great job,will try this with the kids. Awwww, I am so glad!!! Thanks. 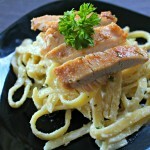 i luv fettuccine-alfredo, add chicken to it and this dish is a winner for sure! cheers! 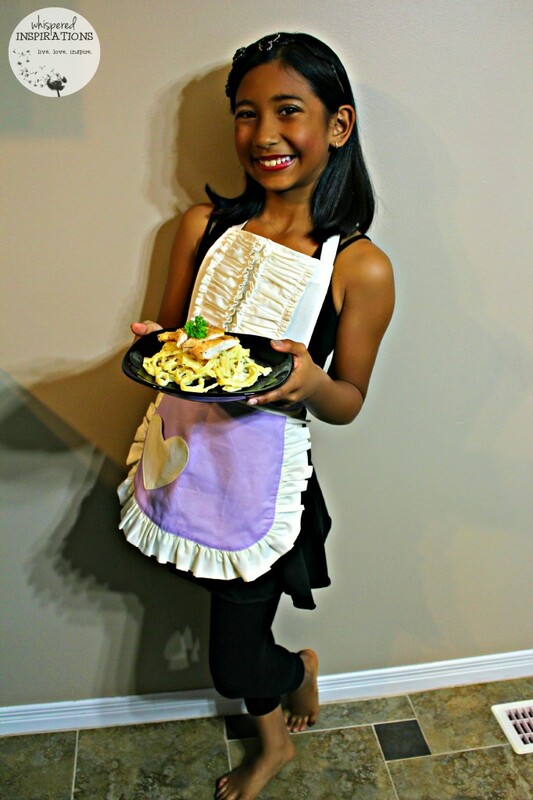 I love fettuccine alfredo so I will have to give this recipe a try and hope it looks as good as Gabby's when I am done! A star in the making! And a cook too. I have seen these aprons before, and they are very cute. But I love this recipe. And I think it is great that you give her the freedom and the guidance to do what she loves. Thanks for sharing. Awww, thanks Elizabeth. I try and I am happy to see her happy. Your recipe sounds really good and so does the picture. Your daughter looks adorable !